Parachute Rigger, a military occupational specialty (MOS) 92R, is arguably one of the most important jobs in the Army. Without a MOS 92R’s focus on details and technical expertise, any soldier who needed a parachute to open safely would be at risk. As the job title suggests, the parachute rigger supervises or packs and repairs cargo and personnel parachutes, and rigs equipment and supply containers for airdrop. Parachute riggers are primarily responsible for repairing textile and canvas items, webbed equipment, and clothing. These soldiers don’t just pack parachutes; they’re tasked with cleaning, inspecting, and storing them as well. They fabricate and assemble airdrop platforms, cushioning materials, rigging components, rig supplies, equipment, and vehicles for airdrops. MOS 92R also is responsible for loading and securing supplies in an aircraft. Perhaps most importantly, this job tests and inspects parachutes, their extraction and release systems, and all the associated parts. These tests are conducted before and after use and at regular intervals to ensure the equipment is always safe for any real-world uses. When needed, these soldiers repair and replace airdrop equipment, including parachutes, and makes sure the machines and tools used for these repairs are well-maintained and working properly. Once a parachute rigger is experienced, they will inspect airdrop equipment and conduct regular quality assurance inspections. They’ll also train lower grade soldiers on how to pack and repair parachutes and other airdrop equipment, and properly dispose of equipment that’s no longer safe for use or too old for future airdrops. Job training for a parachute rigger requires ten weeks of Basic Combat Training and 16 of Advanced Individual Training with on-the-job instructions. Part of this time is spent in the classroom and part in the field. 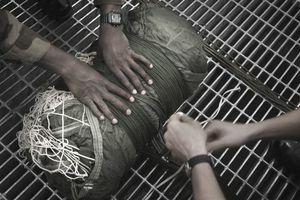 Soldiers in this job learn parachute rigging techniques, how to maintain air-sea rescue equipment, including the repair of survival equipment like inflatable rafts. They'll also learn how to maintain oxygen equipment necessary for airdrops. To be eligible as a parachute rigger, high attention to detail and knowledge of shop mechanics are useful skills. You'll need an 88 in aptitude area general maintenance (GM) and an 87 in combat (CO) on the Armed Services Vocational Aptitude Battery (ASVAB) test. There's no security clearance required for this job, but you'll need a normal color vision (no colorblindness). There aren't a whole lot of post-Army careers that will involve rigging and inspecting parachutes, but there are some. Commercial airlines are the most obvious option, as well as parachute rigging supply companies, survival equipment manufacturing firms and some government agencies. However, it's worth remembering that a job that requires high attention to detail would be a good fit for an Army parachute rigger, as it's a skill that translates well no matter what career you decide to pursue.